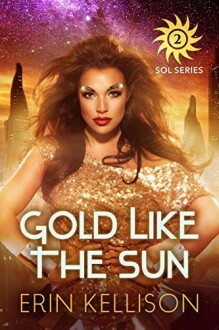 From New York Times bestselling author Erin Kellison, Gold Like the Sun is the second book in the exciting and passionate adventures of the Sol sisters. It's the wedding of the millennium! Princess Pilar Sol and Hakan Frust are celebrating their union with sector fetes full of celebrity and pomp. Theirs is an arranged marriage to preserve the vital commerce of the Nyer Transit Hub, and yet Pilar is madly, unreservedly, passionately in love. She has all the excitement she has long dreamed of—and a little more than she bargained for when she discovers that Hakan's grasping family wants her dead. Hakan has done everything in his power to save his inheritance—the bustling but impoverished Hub—including marrying a wealthy princess for her dowry. His heart isn't supposed to be part of the deal, but Pilar has all the beauty and joy his life lacks. When Hakan runs afoul of his uncle's associates—criminal in nature, violent in approach—he refuses to risk Pilar, not for money, not even for his life. * This novella was originally published in the Hotter on the Edge 2 anthology, which is no longer available.